Amazing idea. Need one of these! Give me a call. I’ll sort one out for you Daniel. If you don’t need a new kitchen, go straight to Quooker or call me. With pleasure. Thanks for commenting! When you say these things are easy to retrofit… what’s involved? Is it a whole through your worktop and space underneath the worksurface to accommodate a gizmo? Ha! You have two options when retro-fitting the Quooker. You can buy the Fusion model and that will mean no new tap holes because it will replace your existing tap AND also give you boiling hot water from the same tap. Or, you would have to have another hole drilled in the worktop in order to accommodate a new tap so you end up with two taps. The storage tank which holds the hot water reserve is about the size of a thermos flask and always fits in the sink base unit. There are no gizmos with the Quooker but some of the other hot taps on the market do need a space for a gizmo. (Gizmo is a great word, isn’t it?). 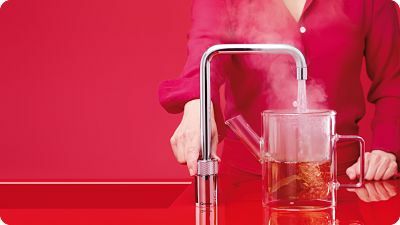 Quooker offer free fitting (at the time of writing this). If you’re buying as part of a new kitchen my fitters don’t charge for fitting hot taps (if they’re fitting the rest of the kitchen). Bubble, bubble – no toil, nor trouble!! Where’s the ‘LIKE’ button on this thing? Best pun yet. My parents have had one of these for a couple of years and they love it……..I still don’t get offered a cup of tea though no matter how much it saves!! Haha. Well, you’ll have to get your own tap then… or take a flask when you go to your folks’ house, I suppose. Always wanted one of these things. What is the starting price? Well, if you’re adding one to an existing kitchen then the most basic model, fitted will set you back about £850. Quooker offer free retro-fitting. If you’re buying one as part of a new kitchen, you should pay less than that but it depends where you get your kitchen!